Whether you’re bullish or bearish, the right side of the trade in Fed speak has been dovish. While Powell got the ball rolling during his press conference following the last FOMC meeting, highlighting the Fed’s “ability to be patient moving forward”, there has been a recent crescendo in cooing. James Bullard, of the St. Louis Fed, warned in an interview with the Wall Street Journal that the Fed is in danger of “possibly tipping the economy into recession” if rate hikes continue. In a speech in Arkansas, Bullard went on to explain he was worried that the Fed is “on the precipice of a policy mistake”. Yellen also joined the chorus. In an interview, she said she believes, “at this point, the Fed will take a breather,” and warned that Powell “shouldn’t tighten so preemptively that he causes a recession.” Even “Leading Hawk” Esther George of the Kansas City Fed was on message, saying in a speech in Missouri that, “A pause... would give us time to assess if the economy is responding as expected” and warned that failing to recognize that hiking rates has a delayed effect “could lead to an overtightening of policy”. Admittedly, recent data has been supportive of the dovishness. The latest jobs data saw unemployment rise from 3.7% to 3.9%. The Empire Fed Manufacturing data came in at 3.9, rather than the expected 10, as “growth continues to slow”. And inflation pressures appear subdued, with Core CPI still at 2.2% and PPI dropping MoM and missing expectations YoY. 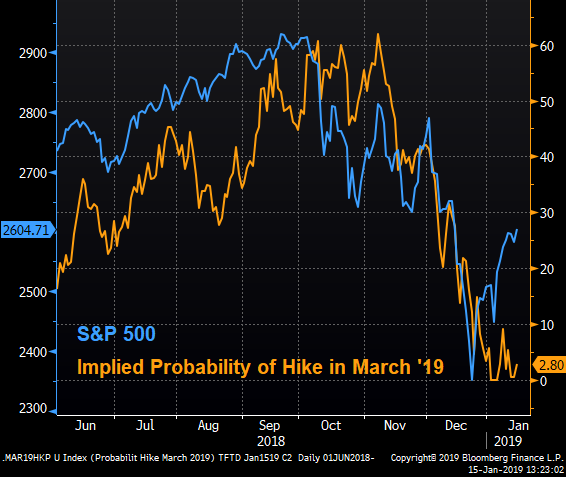 However, watching all this data may be a side-show, as the market-implied probability of a hike has an eerie resemblance to the S&P 500. It’s unclear if this is “right” or not, but as Bullard put drily to the WSJ, “In the last decade, the market has been far more accurate than the committee itself in saying how policy was going to evolve going forward”. Back in February of last year, we highlighted some excellent research by Chris Cole of Artemis Capital Management. Back then, Cole was making headlines for having successfully anticipated the danger of inverse-VIX products. 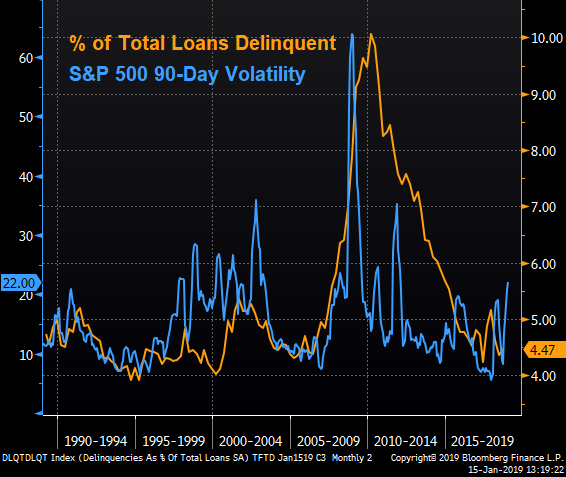 Now he is back, explaining in a recent interview with Erik Townsend of Macro Voices that while there were some fireworks in February of 2018, “We still have the much larger $2 trillion unwind in the global short-vol trade that has just begun to start”. In addition to discussing his views on volatility and risk, the interview covers some problems the Fed could face, potential shifts in the market as traditional correlations breakdown or reemerge, and how various market players could adapt in new market regimes.